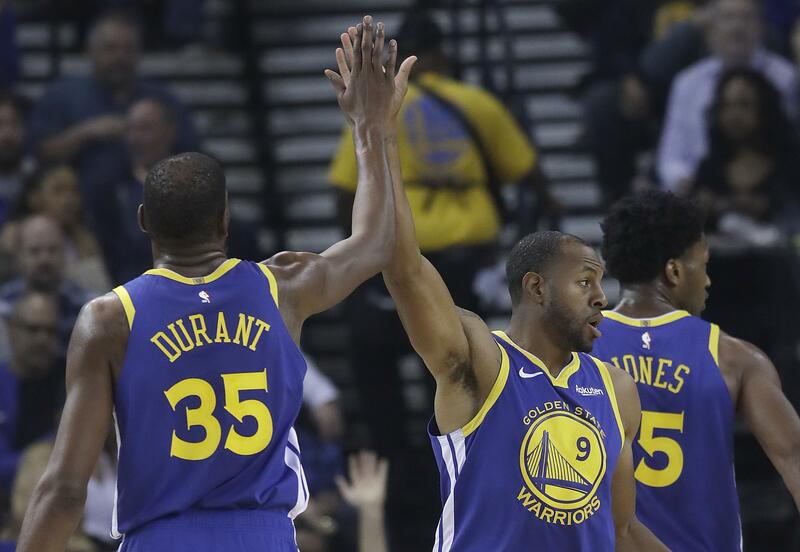 Sat., Nov. 10, 2018, 11:30 p.m.
OAKLAND, Calif. – Kevin Durant had 28 points and 11 assists, Quinn Cook scored a season-high 27 in place of injured Stephen Curry and the Golden State Warriors used another big run in the third quarter to pull away and beat the Brooklyn Nets 116-100 on Saturday night. Klay Thompson added 24 points on an uneven shooting night while Damian Jones had eight points and six rebounds. Two days after losing Curry to a groin injury in a 23-point home loss to Milwaukee, Golden State bounced back with little problem while their leading scorer sat at home watching. Draymond Green also was missing from Steve Kerr’s lineup but Durant made both absences a moot point while ending Brooklyn’s three-game winning streak. The nine-time All-Star had 13 points in the first quarter, scored the final six of the second then came up big again in the third. Joe Harris scored 24 points for the Nets. TORONTO – Pascal Siakam scored a career-high 23 points, Jonas Valanciunas had 19 points and 10 rebounds and Toronto beat New York, improving its NBA-leading record to 12-1. Toronto’s Nick Nurse became the first coach to win 12 of his first 13 games since Lawrence Frank started 13-0 with the New Jersey Nets in 2004. MEMPHIS, Tenn. – Mike Conley scored a season-high 32 points, including 21 after halftime, to help Memphis beat short-handed Philadelphia. Marc Gasol added 18 points and 12 rebounds to help Memphis remain undefeated at home. J.J. Redick led the 76ers with 20 points, The game came hours after reports that the Sixers will trade starters Robert Covington and Dario Saric, along with reserve Jerryd Bayless, to the Minnesota Timberwolves in exchange for All-Star Jimmy Butler. That left the Sixers short-handed, because the players involved in the trade did not dress for Philadelphia. SAN ANTONIO – LaMarcus Aldridge had 27 points and 10 rebounds and San Antonio held off Houston. DeMar DeRozan had a season-low 13 points, but added 11 rebounds in 39 minutes. James Harden had 25 points to lead Houston and Eric Gordon added 23. Chris Paul was held to 13 points on 4-for-13 shooting. The Rockets were without Carmelo Anthony, who missed the game due to illness. LOS ANGELES – Lou Williams hit a jumper with .3 seconds remaining in overtime, lifting the Clippers to the victory. Boban Marjanovic intercepted Giannis Antetokounmpo’s inbounds pass as time expired, sending the Bucks to just their third loss in 12 games. Montrezl Harrell led the Clippers with 26 points off the bench. Patrick Beverley added 21 points and Tobias Harris had 20 points and 11 rebounds. Former Clipper Eric Bledsoe’s 3-pointer tied it at 119 with six seconds remaining. Danilo Gallinari’s 3-point try for Los Angeles bounced off the rim at the buzzer, sending both teams to their first overtime of the season. MIAMI – John Wall scored 28 points, Jeff Green had 19 and 10 rebounds, and Washington ran away in the fourth quarter to beat Miami. Bradley Beal and Austin Rivers each scored 18 points for the Wizards, who won for only the third time in 12 games to start the season. Rivers and Wall had 10 points apiece in the final quarter. Washington opened the fourth on a 31-12 run, before the Heat trimmed what was as much as a 17-point deficit down considerably in the final minutes but never seriously threatened again. Dwight Howard finished with 11 points and 16 rebounds for the Wizards. Josh Richardson scored 24 points and Rodney McGruder had a career-high 22 for the Heat. The Heat were again without Dwyane Wade, who sat a third consecutive game after the birth of his daughter. CHICAGO – Zach LaVine scored 24 points, rookie Ryan Arcidiacono added 15 and Chicago rebounded to beat Cleveland after blowing an early 16-point lead. Tristan Thompson had 22 points and 12 rebounds for the league-worst Cavs. NEW ORLEANS – Anthony Davis had 26 points and 12 rebounds to help New Orleans beat Phoenix. Julius Randle added 22 points and 16 rebounds, and New Orleans never trailed in winning its second straight game after a six-game losing streak. T.J. Warren led the Suns with 25 points. DALLAS – Rookie Luka Doncic scored 22 points and veteran J.J. Barea added 21 off the bench, including 16 in a first-half surge, as Dallas won for the second time in nine games. The Mavericks snapped the Thunder’s seven-game winning streak. SACRAMENTO, Calif. – LeBron James scored 25 points and recently signed Tyson Chandler had 12 rebounds as the Lakers moved to .500 for the first time this season. The Lakers, who began the season with three straight losses, improved to 6-6 and held the Kings, who entered the game averaging 118 points per contest, to their lowest scoring total of the season. It was only the second time Sacramento has been held below 100 points this season, and it marked the first time Los Angeles had held an opponent below 100. De’Aaron Fox had 17 of his 21 points in the first half to lead the Kings, who shot 35 percent from the field and went 6-for-25 on 3-pointers. Published: Nov. 10, 2018, 11:30 p.m.